A rare opportunity to purchase a beautiful four bedroom Victorian property situated in an elevated location with enviable views across the High Weald Area of Outstanding Natural Beauty. The property benefits from a range of farm buildings and stables and sits within approximately 63 acres of land. Eridge railway station is approx. 2.5 miles to the north west providing a mainline service to London. SITUATION: The property is situated approximately half way between the villages of Eridge and Rotherfield both of which have a good range of local amenities and there are further extensive services and amenities provided at Royal Tunbridge Wells (4.5 miles to the north) and Crowborough (4 miles to the south west). Primary schools are located at Rotherfield and Mark Cross and nearby grammar, preparatory and secondary schools are located at Mayfield, Tunbridge Wells, Crowborough and Wadhurst. There is excellent riding in nearby Hornshurst Wood and the Ashdown Forest. Eridge railway station is approximately 2.5 miles to the north west providing a mainline service to London in about an hour. THE FARMHOUSE: Whitehouse Farm is an attractive Victorian property situated in an elevated location in a prime part of the East Sussex countryside. The farmhouse is constructed of red and mixed bricks in a Flemish bond beneath a pitched clay tiled roof. An attractive front door with stained glass panels opens to the entrance hall with a staircase ascending and doors leading to the principal reception rooms of which the drawing room has a bay window to the front, fireplace and surround with an inset woodburning stove and a range of fitted bookshelves. The dining room has an attractive cast iron Victorian fireplace with a decorative hearth and a bay window to the front. The kitchen / breakfast room has a range of bespoke painted fitted wall and base units with an UrbnRok glass and shell resin worktop above with inset stainless steel sink and drainer, Brittania range gas fired hob and chefs plate with an electric oven and Omaggio hood, integrated fridge, larder cupboard, dishwasher and glass splashbacks. The utility room has plenty of space for appliances, a range of wall and base units and a sink. The garden room enjoys a pleasant view and has double doors that open onto the terrace and gardens. There is also a rear lobby, boot room, cloakroom and study on the ground floor. The first floor has an open split level landing leading to the master suite having a large bedroom with vaulted ceiling, dressing area with fitted wardrobes, and en-suite bathroom with a separate shower. There is a guest bedroom with en-suite shower room and an attractive fireplace, two further double bedrooms (both with fireplaces) and a family bathroom. The property has retained many features typical of the Victorian period including high ceilings, attractive stained glass, bay and sash windows, wooden floors, original doors. skirting boards and coving. There is ample loft space that has been insulated but not boarded. GARDENS: There are attractive gardens surrounding the property which have been thoughtfully planted with an array of colourful plants and shrubs. The lawn is interspersed with mature trees and is securely fenced at the border. An attractive sand stone terrace provides a pleasant seating and dining area. There is also a greenhouse, storage sheds and a productive vegetable garden with raised beds. A traditional brick outhouse has been converted into a useful storage building. The gardens are flanked by a post rail paddock with a large field shelter. GARAGES: There are two large combined brick built double garages with power, lighting, up and over doors and a brick stable to the side. Agricultural building 1: 32.50m x 7m (106ft x 23ft) Concrete portal framed, fibre cement roof, chalk floor. Agricultural building 2: 18.5m x 15m (60ft x 50ft) Concrete portal framed, fibre cement roof, chalk floor. Stables: 21m x 5.30m (70ft x 18ft) Three timber framed stables with covered yard, Water and power connected. Bull Pen: 5.2m x 5.45 m (17ft x 17ft) Timber framed shelter and pen. THE FARMLAND: The total area of the farm extends to approximately 63.93 acres (25.87 hectares). The farmland is all laid to pasture and has been used to support a rare breed pedigree beef, lamb and organic egg laying enterprise. The land is geographically divided by Blackdon Hill with a total of approximately 36.81 acres (14.90 hectares) situated on the west side Blackdon Hill and 27.12 acres (10.97 hectares) situated on the east which includes approximately 4.37 acres (1.77 hectares) of woodland. 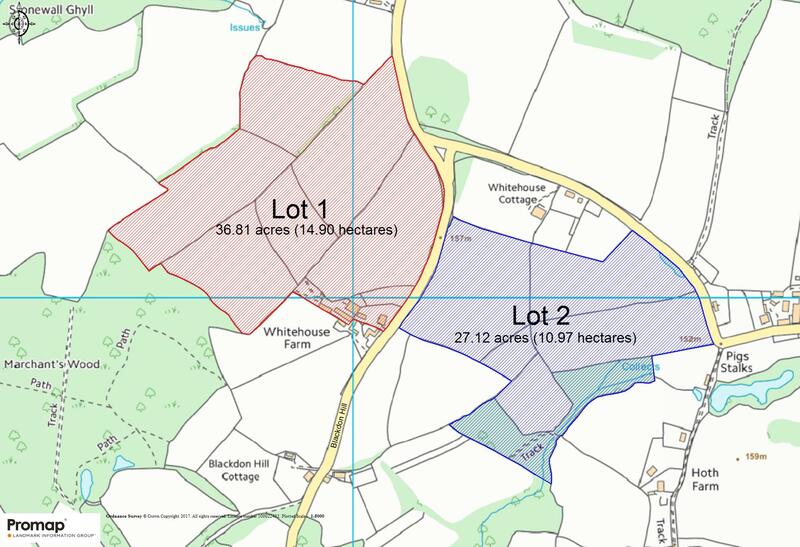 The fields are divided by fence and hedge boundaries and the land is classified as Grades 3 and 4 on the Agricultural Land Classification Map. The land to the east is being offered for sale as a separate lot (Lot 2) but please note that a sale of just Lot 2 will not be sold until a sale of Lot 1 has completed. THE WOODLAND: 4.37 acres (1.77 hectares) of woodland surrounds a wild flower meadow and has an abundance od bluebells and wild orchids in the spring. ACCESS: Lot 1 is accessed through the main farm entrance on the west side of Blackdon Hill and Lot 2 is accessed through a gateway on the opposite side of the road. BASIC PAYMENT SCHEME: The land is registered with the Rural Payments Agency and a claim has been made under the 2017 Basic Payment Scheme. All payments for 2017 will be retained by the vendors and the purchaser will agree to comply with the Cross Compliance requirements of the scheme until the end of the current scheme year. Appropriate entitlements will be transferred as part of the agreed sale price on completion subject to each purchaser contributing £250 plus VAT to the cost of the transfer. PUBLIC RIGHTS OF WAY: There are no public rights of way that cross the property. SPORTING RIGHTS: All sporting rights are included in the freehold sale. COUNTRYSIDE STEWARDSHIP: There are no Countryside Stewardship or Environmental Stewardship agreements in respect of the land. Part of the farm is registered as organic.